This Sterling Silver heart charm bracelet can be personalized on both sides of the charm with the engraving of your choice. With many font styles to choose from you can customize your bracelet exactly how you like. The heart charm measures .75 inch and the bracelet is adjustable in 3 to 8 inch lengths. 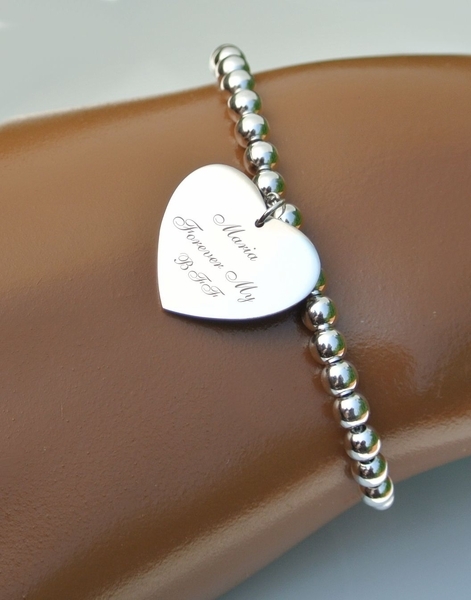 This silver heart tag bracelet has a polished finish, and can be engraved. We carry most of our engraved bracelets in higher quantities and offer discounts for corporate gifts, weddings, reunions and more.